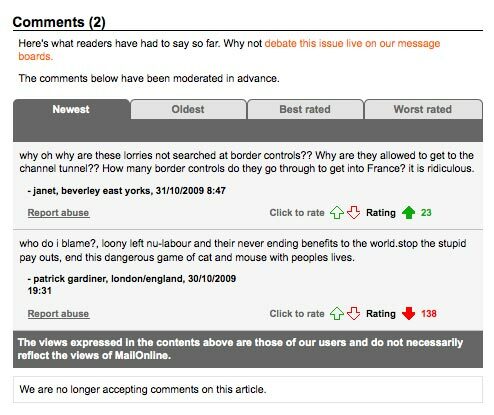 Commenters on Guardian.co.uk’s liveblog covering the shootings in Whitehaven today challenged the site over its decision to publish comments on the blow-by-blow coverage. The liveblog, a format which has been used to good effect by the Guardian previously, particularly for its G20 coverage and Andrew Sparrow’s election coverage, has been aggregating news coverage of the events as they unfold and updating with police information and eyewitness statements. I think having a comment section on this is pretty ghoulish and in bad-taste (…) Best just to let the truth come out properly instead of this rolling, almost certainly erroneous way of doing things. Yes, as earlier commenters have said, please switch the comments off. It is legitimate – and might even help save lives – for the media to seek minute-by-minute updates from people there and quickly broadcast any information that is relevant. But it does not have to be public. There are very good technical reasons to cover a fast unfolding story in this way, which are nothing to do with turning into Fox News but are to do with speed of publishing and being able to correct things quickly. However, we’ve discussed it and think the bulk of commenters are correct, it’s not a particularly useful way to source information on a story such as this, so we will turn the comments off. Thanks to those who raised it constructively. This entry was posted in Online Journalism and tagged commenting, cumbria, cumbria shootings, guardian, liveblogging, whitehaven on June 2, 2010 by Laura Oliver. Telegraph Media Group’s head of technology Shane Richmond weighs in on a debate about the value of comments left by readers on newspaper websites. This prompted a response from Ilana Fox, who ran online communities for the Sun and Mail Online, disagreeing with Jarvis and arguing that the majority of people interacting with newspapers online aren’t “assholes” at all. Jeff makes the point that inviting readers in after the fact is disrespectful, which is what leads to the unconstructive nature of much commenting. But I’ve noticed that engagement by journalists breeds a culture of respect. If journalists join the conversation, they are more likely to be respected by readers. I don’t think the “true collaboration” that Jeff would like to see is a replacement for commenting. Many people are happy to comment and don’t want to do more. True collaboration builds on the work we’ve done so far. And it is a goal that many of us are working towards. This entry was posted in Editors' pick, Online Journalism and tagged commenting, interaction, Moderation, Newspapers, online newspapers, reader comments, Shane Richmond on April 23, 2010 by Laura Oliver. In 2009, blog network Gawker Media introduced a new, stricter commenting system in an attempt to free the site from certain readers who were dominating comment threads. Nieman Journalism Lab has the full rundown of how the system now works, which includes trusted commenters having greater access to discussions and most recent comments placed at the top rather than bottom of threads to steer discussion. “We’ll be able to encourage the kind of discussion that *we* want – not one that is dominated merely by the most prolific of our commenters. It’s our party; we get to decide who comes,” wrote founder Nick Denton at the time. Though there were some calls to do so, purging commenter accounts is not a solution for the out-of-control commenter community. Nor is a large moderation staff. We believe pruning, and a commenting platform as we have implemented, will lead to increased participation, while at the same time encouraging quality. This data, and the subjective opinion of many, seem to back this assertion. This entry was posted in Editors' pick, Online Journalism, Social media and blogging and tagged commenting, Gawker, gawker media, Nick Denton, reader comments, Tom Plunkett on April 14, 2010 by Laura Oliver. New York Times technology reporter Richard Pérez-Peña examines the problem of anonymous comments being widely permitted on news sites. With the Huffington Post and the Wall Street Journal announcing plans to revise their comment systems, will other mainstream news organisations begin to reconsider this well-established policy? No one doubts that there is a legitimate value in letting people express opinions that may get them in trouble at work, or may even offend their neighbours, without having to give their names, said William Grueskin, dean of academic affairs at Columbia’s journalism school. This entry was posted in Editors' pick, Press freedom and ethics and tagged commenting, Huffington Post, New York Times, online comment on April 12, 2010 by Joel Gunter. A ‘vulgar’ comment from a man on the St Louis-Post’s Dispatch website, STLtoday.com, resulted in him resigning from his job. Kurt Greenbaum, online news director and director of social media at the paper, explains how he twice deleted the comment. “[I then] noticed in the WordPress e-mail that his comment had come from an IP address at a local school. So I called the school. They were happy to have me forward the e-mail, though I wasn’t sure what they’d be able to do with the meager information it included,” explains Greenbaum. This entry was posted in Editors' pick, Online Journalism, Press freedom and ethics and tagged commenting, St. Louis Post-Dispatch, us on November 20, 2009 by Laura Oliver. This is a cross-post from Malcolm Coles’ website www.malcolmcoles.co.uk. Is the Sun censoring pro-Brown comments? The Sun is running a campaign against Gordon Brown. But I’ve analysed the comments on its website – and readers disagree with its stance by a ratio of more than 3 to 2. The paper has exploited the grief of Jacqui Janes over her son Jamie’s death in Afghanistan to attack the PM – because his handwritten letter of condolence was supposedly disrespectful due to sloppy writing and (disputed) spelling errors. It’s loathsome journalism that ignores the effect of his disability (the PM is blind in one eye). And it seems Sun readers are mostly on the Prime Minister’s side. 42 were anti Gordon or pro the Sun’s stance. 69 were pro Gordon or anti the Sun’s stance. So that’s more than 60 per cent who don’t agree with the Sun, and less than 40 per cent who do. The Sun is channeling this woman’s grief into a personal attack on the Prime Minister. It’s refusing to make allowances for his disability (maybe we could next attack the war wounded for being workshy benefit scroungers?). And it’s facilitating her breaking data protection laws by releasing a recording of a private phone call. The whole thing is sickening – let’s hope that observing its readers’ reactions will lead to an end to this (not that this happened in the Jan Moir case) – and preferably prosecution of the Sun over the data protection offence. This entry was posted in Comment and tagged commenting, jacqui janes, malcolm coles, The Sun on November 12, 2009 by Malcolm Coles. The introduction of a rating system for comments on articles on the Daily Mail’s website back in December last year was a bold move for a site that often publishes highly controversial (or certainly comment-provoking) articles. Comments on the site can be removed by the editorial team if necessary, but the aim of the system is that users will act as moderators, flagging up inappropriate content. One particular story last weekend tested its mettle: the report on the death of a man in the back of a lorry in the channel tunnel. The article in question provoked a spate of offensive and abusive comments (as shown in this screengrab captured by FiveChineseCrackers.com). As Mail Online’s terms and conditions page states, the site is not liable for third party content including comments posted by users. “As regards the Channel Tunnel story, several inappropriate comments were posted until they were rightly flagged up through the ‘report abuse’ facility when we immediately took them down. This shows our system is working as it was designed. “The comments facility is a much-loved part of Mail Online and phenomenally popular. This entry was posted in Online Journalism, Social media and blogging and tagged commenting, Mail Online on November 5, 2009 by Laura Oliver. The Times has introduced a new commenting system for its website lifting the upper word limit for comments from 300 to 2,000 and introducing a registration system. “This will enable us to highlight and reward our best commenters, and weed out our least constructive,” writes online editor, Tom Whitwell – though no fixed reward system is mentioned, as yet. Commenting systems differ between the paper’s blogs and the rest of its editorial content, but there are plans to switch the blogs over to the new platform. This entry was posted in Editors' pick, Social media and blogging and tagged commenting, comments, online editor, Online The Times, Times Online, Tom Whitwell on July 16, 2009 by Laura Oliver. Video of the Citizen Media Project’s David Ardia explaining why – under US law – editors are not legally liable for changing comments left on their news sites. This entry was posted in Editors' pick, Legal and tagged Citizen Media Law Project, commenting, comments, David Ardia, Pat Thornton, United States, us on January 29, 2009 by Laura Oliver.